In order to preserve your recorded videos of funny TV shows, collect favorite online videos into one album, or prevent precious new purchased DVDs from being scratched, you may need to burn them to rewritable DVD discs with DVD burning software. Honestly, there is too much DVD burning software in the market. For choosing the most appropriate one, there are 4 points for reference: ease of use, quick burning speed, powerful features and stable performance. According to the four primary elements, user' feedback, professional reviews and questionnaires, We conclude the following 2019 top 3 Windows (10) DVD burning software: WinX DVD Author, ImgBurn and CDBurnXP and present reviews on the best 3 DVD burners. WinX DVD Author - make DVDs from any video file. Free burn videos (MP4, AVI, WMV, MKV, M2TS, FLV, 3GP, RM, MPEG2, VOB etc,) to DVD with vivid images and hi-fi audios. WinX DVD Author, a free Windows (10) DVD burning and authoring application, enables users to burn video files VOB, MP4, AVI, MKV, M2TS, WebM, FLV etc. to DVD with great audio and video quality in a fast and simple way. You can also author chapter menu and subtitle with international languages, such as French, German, Japanese and Chinese. In addition, WinX DVD Author offers a YouTube downloader for conveniently downloading online videos for burning to DVD later. 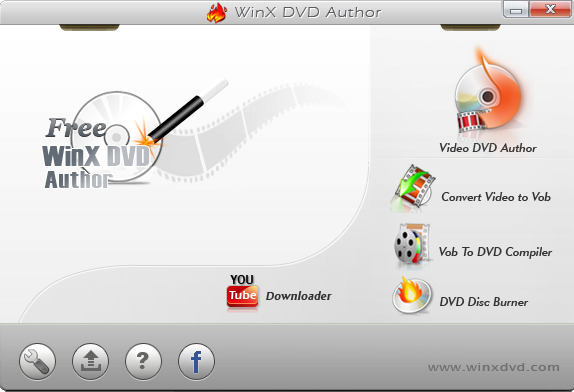 WinX DVD Author offers a very easy solution to free burn videos to DVD. Designed with a straightforward interface, you can easily access where to convert various video files to VOB, create menu and output DVD-Folder, burn VOB file or DVD-Folder to DVD disc and download YouTube content. Only 3 steps, you can get a burned DVD disc from your video files: add the source video-create menu-start burning. It also allows you to adjust aspect ratio, video type (NTSC or PAL), DVD Type (DVD-5 or DVD-9) as well as menu and subtitle settings. If there are some unwanted parts in the source video, like warnings, trailers, ads, titbits, you can set the start/end time to cut the parts before burning to DVD. | Also need to copy DVD9 to DVD5? Because of embedded powerful decoder and encoder engine, WinX DVD Author can not only burn a large wide range of video formats to DVD, but offers the fastest burning speed and delivers almost lossess quality of the burned disc. As a totally stand-alone and safe DVD burner software for Windows 7/8/10, WinX DVD Author has a clean installation pack without hiding any confusing plug-ins or malicious software. After installation, you can get a clean UI without ads or other extras. ImgBurn is a piece of lightweight free disc burning software for Windows (10) in 2019, which is specially designed for burning CD, DVD & Blu-Ray. It is capable of writing images like ISO & files/folders to DVD disc and creating ISO image from DVD disc, files/folders. Also, it can verify and discovery disc for checking if the disc is completely readable and how about burning quality. All features are classified in 5 modes: Read, Build, Write, Verify and Discovery. CDBurnerXP is also free DVD burning software for Windows (10) to burn CD, DVD and Blu-Ray to allow users to copy DVD disc, create ISO from image, burn DVD disc from video/audio/ISO images and erase contents from rewritable medium. CDBurnerXP has a colorful interface among top 3 DVD free Windows (10) burnning software. Also, it lists key features on the main interface to be convenient for users to quickly find what they want. To be frank, it can be easier operated than ImgBurn but a little complicated than WinX DVD Author. Click Data disc to enter Data compilation and you may need a guide or have several tests to be familiar with contents it shows. In addition, CDBurnerXP requires you to install Windows .NET Framework on your PC at first because it is mostly written in Visual Basic .NET. For this, some people turn to select other DVD burning software rather than installing .NET Framework with a long-time. If you still have questions about how to choose the best one from the top 3 free Windows (10) DVD burning software, check the feature comparison table below which may give you some suggestion. From reviews and feature table, you can find that all the top 3 free DVD burning software are very useful to burn kinds of videos, like MPEG, AVI, MP4, MKV, to DVD discs. Besides basic DVD burning functions, WinX DVD Author can create menu, add subtitle for DVD as well and offers an equipped YouTube video downloader for users to burn online videos more conveniently. Comparing with the other two burners, WinX DVD Author is easier to install and operate. Without any adware, spyware and plug-in, it is extremely safe and no threats on your system. To sum up, WinX DVD Author is the best free DVD burner for users who want to free burn videos to DVD on Windows (10) in a simple and fast way. Review on 2019 Best Free DVD Burner for Windows 7/8.1/10. How-to Tutorial on Burning MP4/AVI/MKV and More to DVD. The best free DVD burner software for Windows 7 will be shown here to help you free burn any video (MP4, AVI, MKV, M2TS etc,) to a blank DVD disc in a simple way. Free download 2019 best free DVD burner for Windows 10 (32 & 64 bit), and learn how to burn video to DVD disc with only 3 steps.